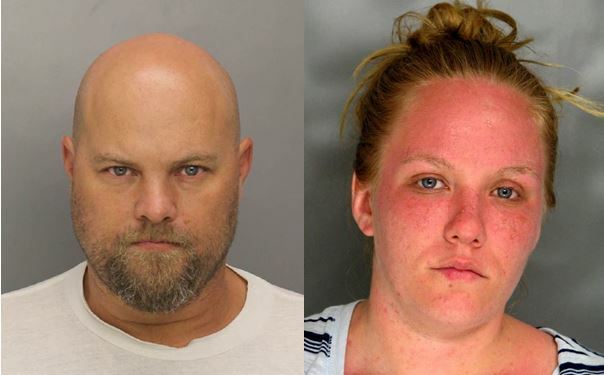 CLEARFIELD – Two people are accused of having a stolen vehicle in Clearfield Borough. Christopher Scott Walters, 44, of Theodore, Ala., has been charged by Officer Mitchell Klender of the Clearfield Borough police with a felony count of receiving stolen property; a misdemeanor count of false identification to a law enforcement officer; and two summaries. Bail has been set at $100,000. Walters’ co-defendant, Autumn Rose Hall, 33, of Lock Haven has also been charged with a felony count of receiving stolen property. Bail has been set at $25,000. Both Walters and Hall waived their rights to preliminary hearings Wednesday during centralized court at the Clearfield County Jail. According to the affidavit of probable cause, police received a report about an assault at 9:07 p.m. July 13 in the 300 block of East Pine Street. Upon arrival, officers made contact with the victim outside the building. He said he had come down the stairs at the rear of the building and knocked to speak to tenants about water leaking. He said two males started yelling at him from another apartment. He said the males confronted him and started to punch him in the face and kick him. Klender observed slight redness and a minor abrasion below the victim’s right eye. After speaking with the victim and other witnesses, officers went to the apartment and were let inside. Klender could observe a male down the hall and had him come out into the kitchen area. A female was inside the same room with him and she followed behind him. The couple told officers that they didn’t have identification on them but provided their names and birthdates. The female was identified as Hall and this was confirmed by a photograph with the in-car computer. However, the male told police that his name was Charles Johnson and his birthdate was Oct. 27, 1971. He also said that he was from Georgia but had a Pennsylvania license. Police were told the victim was assaulted by a male who had left prior to their arrival. While Clearfield County Control was attempting to verify information, police had the victim attempt to identify the male who assaulted him. The victim stood at the bottom of the stairs and police had one male step out. Police were told he was not one of the males involved in the assault. Police asked the male, who had identified himself as Johnson, to step out next and the victim said he was one of the two males who had struck him. County Control and Klender were unable to locate any records for the name and birthdate provided by the male who claimed to be Charles Johnson. He was advised that he was under official investigation and if he provided a false name, he would be charged. The male assured police the information was correct and then provided his Social Security Number. Officers placed handcuffs on Walters behind his back and double locked them. The warrant was confirmed by Clearfield County Control, and it was listed as “in-state pick-up only.” Klender indicated in court paperwork that the SSN Walters provided was incorrect, as well. Walters was led down the stairs out of the apartment and put in the rear of the patrol unit. While clearing the apartment, an officer observed a teal-colored Honda Accord with an Alabama registration parked along East Pine Street. Police ran its registration information and found that it was stolen out of Alabama. This was confirmed by County Control, which sent a hit to the Mobile County Sheriff’s Office. A neighboring resident approached when police were examining the vehicle. She said she had observed two males and a blonde female exit the vehicle earlier in the day. She also said she saw them moving several items from the trunk. When Klender went back to the apartment, he was advised that Hall had just left with a male. An officer remained on scene with the vehicle, while Klender searched the area for Hall and the male. Both were located on North Fifth Street just up from East Locust Street. Hall agreed to come to the station to speak with police. Hall said she and Walters were previously together but had split up. He had reached out to her and met her in Williamsport. When he picked her up, she said Walters told her the car was “hot,” which she assumed meant stolen since he didn’t have money to buy one. Police spoke with Walters after reading his Miranda Rights. He eventually requested to speak with an attorney. Police spoke with the officer investigating the motor vehicle theft and confirmed that Walters and Hall were the suspects.